Your skin can often give you clues about what's going on inside your body — but what it's saying might surprise you. For example, if you have psoriasis, you may suspect that it's telling you about inflammation within your body — and you'd probably be right. But I bet you wouldn't guess that psoriasis can also be a warning sign to check on your bone health. 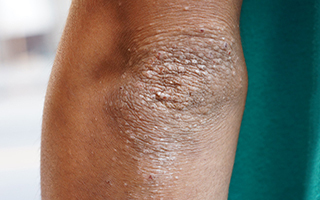 It turns out that psoriasis can be linked to osteoporosis, particularly for women. Psoriasis doesn't cause osteoporosis directly. But there may be a common underlying factor: vitamin D. Researchers in Turkey wanted to find out if vitamin D was involved. For this study, the researchers examined 43 participants with psoriasis and 41 without. All of the participants were under the age of 50, and none of the women had entered menopause. The researchers evaluated a number of factors, including demographic information and vitamin D levels, and measured their bone mineral density. They found that the psoriasis group did indeed have lower femur-neck and lumbar spine scores than the control group, particularly the women. Overall, the two groups didn't have major differences in vitamin D levels. But then the researchers divided the groups by gender. It turns out that the female psoriasis patients had significantly lower levels than the females in the control group. It was just the men whose levels were about equal. Since osteoporosis is of particular concern for women, these findings are an important reminder to pay attention to vitamin D. Low levels of this important vitamin have been implicated in a number of diseases besides osteoporosis and psoriasis. If you suspect your levels may be low, your doctor can run a simple test to find out. Many of us are low, especially in the winter months. And if you have psoriasis, it's especially important that you get your vitamin D into a healthy range. You can find 5,000 IU tablets of vitamin D by following this link. You'll help protect not just your outsides, but your insides as well. Solak B, Dikicier BS, Celik HD, Erdem T. “Bone Mineral Density, 25-OH Vitamin D and Inflammation in Patients with Psoriasis.” Photodermatol Photoimmunol Photomed. 2016 Feb 12. doi: 10.1111/phpp.12239. [Epub ahead of print].